I sat in bed Sunday morning drinking tea, reading, and savoring the coziness of my down comforter. I took a long walk in the woods to see the brilliant trees changing to vibrant oranges and reds. You may feel the desire to pull inwards and reflect, rest, and restore a bit more as well. You may have noticed that urge for more warming fall foods to nourish your body as well. Now that another fall season is upon us, you may feel ready to let go, forgive, and heal as you watch the leaves fall to the ground yet again. All of these intuitive knowings are exactly why SYNCHING up with the SEASON is a brilliant practice. When we SYNC up with nature we also maximize our MOJO. Our life force lights up. Each season in Traditional Chinese Medicine is linked to a specific energy, organ, color, sense and element. Fall is the season of downward and inward energy, lungs and large intestine, letting go of sadness and grief, the metal element, our sense of smell, and the color white. 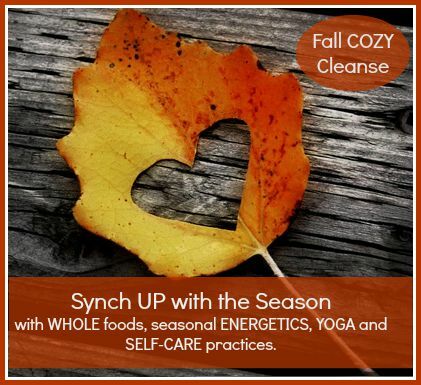 As we descend this fall, we have the opportunity to both let go and purify physically and energetically for the rest of the season to bring us more vibrant health and radiance. Here are my favorite 5 HEALTH HABITS to SYNC up with the SEASON to make a magnificent impact on your health, harmony and happiness. Warming foods: Foods that are slow cooked, root veggies that carry the downward and inward energy such as ginger, onion, leak, garlic and beats. Wear Warm clothing: To insulate and nourish the lungs we must be warm. Even if the weather is warmer than an average fall day, stay attentive to the season, the cooler nights, and the need to take deep care with warming up the core. Your immune system will thank you. Make sure you and your family exercise regularly. Pump the lungs often so they are strong and cleansed with rigorous life-giving breath. Many foods in the fall are known to support the lungs. Root vegetables such as onions, leeks, and ginger are supportive to the lungs. Fruits such as apples and pears care for the lung tissue as well. Eating with the season is the perfect way to maintain healthy lungs. The season of fall is the perfect time to gently detoxify and cleanse our bodies, our homes and our minds. We all come across toxicity each day in our foods, in our environment, and with our daily stresses. When we cleanse our homes and our environment by cleaning with natural cleaners, letting go of old clutter and creating a sacred space in our home, we have the perfect place to rest and restore as the season often pulls us to spending more time at home resting and restoring. When we cleanse our minds through meditation and mindfulness practices, we create a healthier and more calm relationship to daily stressors that can throw us off balance. We deepen our connection to ourselves, and we stay more centered in our lives. As you watch the leaves falling from the trees and becoming the earth‘s nutrients for next year’s planting, it becomes obvious that fall has an energy that flows downward and inward (as opposed the upward and outward energetics in the spring). What are the aspects of your life that ground you? Make a list and practice these grounding activities regularly in the fall. It is a nice time to take long walks in the colorful forest and feel the leaves crunching under your feet. Consider collecting nuts, pinecones and fall treasures for an altar or a fairy garden with your children. These small autumn rituals and habits help us harmonize ourselves with autumn. It is natural to sleep more, rest more and begin to turn inward towards introspection and healing. Lush sunflowers, tucked in with the plump orange pumpkins, are an abundance to celebrate. The colors, foods and celebrations of fall are profuse. Feel gratitude for the beauty of the harvest. Set a seasonal outdoor table rich with a cornucopia of color and nature’s gifts to warm the heart for any celebration. Share a gratitude blessing before your meals, as it promotes health and happiness. Light a bonfire to take away the chill of the evening and join in a circle of friends celebrating fall in its glory. Take it in! The abundance is around you and within you. Your only job is to notice and appreciate its radiance. Remember all you need exists within. You are the strength, you are the love. If you want to join our group, we start October 12th (introduction October 11th). If you are ready to begin on your own, just let me know, we have you covered.